All men grow older but few men grow. I read that somewhere and it’s stuck with me ever since. Most of you know me as a confident, well-dressed, middle-aged guy with a balanced portfolio. That’s me now, but I wasn’t always that way. There were a few skills I needed to master and lessons I needed to learn to become the 40-year-old me you see today. The fact is that with good genes and a bit of luck we’ll all turn 40. But it takes a conscious effort to develop the skills required to become 40. Yes, all men grow older but few men grow. So I’m sharing with you the 10 skills/lessons every man should master by the time they are 40. Call them the minimum admission requirements to Project 40. Just like jazz standards for musicians, these standards are an important part of any middle-aged man’s repertoire. No matter what your profession, you always have a need for at least one good suit in your closet. Bonus tip: The bottom button on your suit jacket is not meant to be buttoned. 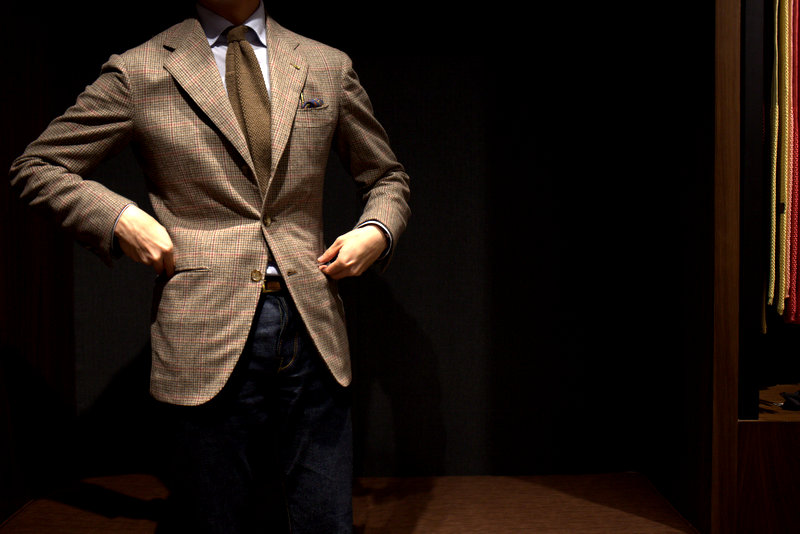 If you insist on wearing a three-button jacket, just the middle button needs to be fastened. A turning point in a man’s life comes when dinner parties at your place cease to consist of pizza and beer. When you can serve your guest a meal that you have created yourself, you have truly entered grown manhood. My friend Pat shared a great crab cake recipe on this blog. That’s a good place to start. Just like with a suit, there will be a time regardless of your profession, when you’ll need to put on a tie. This is your job. Not your wife’s. Every man needs a signature drink. You walk into your local pub and sit down. The bartender walks over and asks what you’d like… You’re on deck… Without hesitation… Without looking at a menu or humming and hawing… What is your drink? Whatever it is, it should just flow off your tongue. What’s my signature drink you ask? Well I’ve recently graduated to premium bourbon. Double Knob Creek neat. Ordered in a deep voice. Not that you need to be an expert gambler, and you may never have to place a bet in your life. But it’s a good skill to have in your back pocket if it ever comes up. You never know when guys night out will break into a card game or you take a last minute trip to Vegas. Here’s a tip: In a championship game always take the under. Sports books know that people will bet more on the over hoping for a high scoring exciting game. They always raise the over/under totals a little higher. It’s always best to bet with the house… You know the house always wins. Hold on… Give me one second… I just need to get up on my soap box for this one and the old body isn’t as limber as it used to be… Ahhh, there we go… Now, if you have a job, are looking for a job, own a business, pay taxes or have the intention of doing any of these things in the near future, you have a vested interest in both the economy and in politics. The world is changing. Both wealth and poverty are increasing, and the middle class is eroding around us… There are a lot of people wearing tin foil hats that can explain why this is happening. You should have your own view and a plan for financial security. There you go, quick and painless… now let me step off of this box. Tip: Choosing a California Cab is a safe go-to pick if you are in a pinch. First, please put the tip calculator away. We’re grown men now. Second, leave the waitress a 20% tip you cheapskate. Now that we’re clear on that, the tip is pretty easy. Take a look at your bill, move the decimal place to the left one position and double that number. So if your bill is $60.00. Move the decimal place to the left one position. This gives you $6.00. Then double it. So your tip is $12.00. Even George Clooney has been dumped. Getting dumped is one of the great life lessons. We learn what partners like and don’t like about us, but more important, what we like and don’t like in partners. By the time you’ve reached 40 you should have taken the risk with someone and had your heart broken. You know that “It’s better to have loved and lost” stuff… It’s actually true. Here are a couple of tips: If you are the dumper, do it at her place. It’s just easier and cleaner that way. Also, remember this is a vulnerable time for your soon to be ex. Regardless of what may be offered to you at the “heartbreak hotel”, leave as a gentleman with your reputation intact. Just make a clean break. You’ll feel better about yourself the next day. I’m truly surprised how many people don’t know this. You really are rolling the dice every time you leave the house if you don’t have this knowledge. And it’s a strategy that can be used in many situations. Try to inch away slowly, making sure to never get between a mother and her cub. If there is still a good distance between you, and you have it available, spray a blast of bear pepper spray. If pepper spray is not available, roll yourself up in a ball and play dead. Remember to protect your face and neck and remain still for 20 to 30 minutes. I find this strategy also works if you make the mistake of cheering for the wrong team at a Detroit Pistons game. Pistons fans can be rough. Every dude should read this. Sage advice. Love the post! Very well written.